And for “The Captain,” that meant looking squarely ahead to the 102nd edition of the Indianapolis 500…albeit with a peek into the rearview mirror of Team Penske. joined by Rick Mears, who as the “Rocketman” won all four of his Indy 500s driving for Penske and Tim Cindric, president, Penske Performance Inc.
A video of Penske’s Indy car victories and the A-list of drivers who delivered them _ Mark Donohue, Tom Sneva, Mario Andretti, Bobby Unser, Mears, Danny Sullivan, Al Unser, Emerson Fittipaldi, Al Unser Jr., Paul Tracy, Gil de Ferran, Sam Hornish Jr., Castroneves and Will Power _ quickly added up to 200. ”We want to make that 201 this weekend,” said Power, who handed his boss that landmark 200th win at the INDYCAR Grand Prix on the IMS road-course on May 12. Four-time NASCAR Cup Series champion Jeff Gordon received a record 96 percent of the votes in a selection process that placed three drivers and two team owners into the NASCAR Hall of Fame in downtown Charlotte, N.C.
Honored along with Sir Jeff during the Feb. 1, 2019 induction ceremonies will be 1992 NASCAR Cup Series champion Alan Kulwicki, Davey Allison and championship team-owners Penske and Jack Roush. Kulwicki and Allison were killed in separate aviation crashes within four months of each other in 1993. NASCAR Vice Chairman Mike Helton also announced the late Jim Hunter, longtime publicist and NASCAR official, as recipient of the 2019 Landmark Award for Outstanding Contributions to NASCAR. Gordon’s shoe-in of an election earned headlines across the nation Thursday, momentarily upstaging Penske. And the 81-year-old graciously said he understood. “Jeff Gordon is a premier driver. He changed the sport,” said Penske, whose NASCAR organization competed against Gordon and NASCAR Hall of Fame team-owner Rick Hendrick beginning in the mid-1990s. “I look at not just the four people that I’m joining in the Hall of Fame. I’m looking at all the great people in the Hall of Fame. I’m glad to be in the class of five. Penske was one of America’s most successful young road-racers when he retired from driving in 1965 to focus on his business interests. As founder and chairman of Penske Corp. he oversees a diversified, on-highway transportation services company with revenues in excess of $20-billion operating in more than 3,300 locations and employing approximately 44,000 people. Need to rent any size truck? Penske has a fleet of ‘em available in signature bright Pennzoil yellow. Race cars owned and prepared by Team Penske have produced a combined 489 major race wins, 556 pole positions and 32 championships across open-wheel, stock car and sports car racing competition. Over the course of its 52-year history, the team has earned a record 16 Indianapolis 500 victories, one Formula 1 win and overall victories in the 24 Hours of Daytona and the 12 Hours of Sebring. In NASCAR, Team Penske captured the Cup Series championship in 2012, the NASCAR Xfinity Series championship in 2010 and four of the last five Xfinity Series owners’ championships (2013, 2014, 2015 and 2017). The organization has produced 108 Cup Series victories, including Daytona 500 wins in 2008 and 2015 and 65 Xfinity Series wins. In addition, Penske helped build and/or operate several successful racetracks in the sport, including Michigan International Speedway, Auto Club (originally California) Speedway, Nazareth Speedway, Homestead-Miami Speedway and North Carolina Motor Speedway. But Penske traces his ongoing love-affair with motorsports to the 2.5-mile Indianapolis Motor Speedway during its post-World War II revival. “I go back to 13 or 14-years-old and my dad brought me here in 1951,” said Penske, who garnered 68 percent of the votes needed for HOF selection. “We were late getting here and we went to a house and there was a show car there, and I’ve got a picture of myself sitting in one of those front-engine Roadsters. I put that up in my room, and I guess I never forgot it. Castroneves, who is continuing as Roger’s longest-tenured driver as a rookie in the IMSA WeatherTech SportsCar Championship, has racked-up 32 total wins and 53 total poles in Penske machinery. Mears collected three Championship Auto Racing Teams (CART) titles and 29 victories for Penske en route to becoming the third and most recent four-time Indy 500 winner. 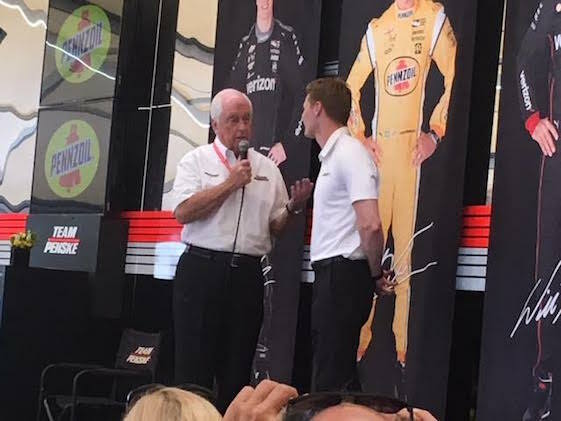 “It’s been an incredible relationship between myself and Roger since Day One,” said Mears, a consultant for Team Penske. “Roger never pressured me from the moment I met him. There was never a time he came and said, ‘You need to do this.’ He always let me do things at my pace. He never pressured me to be a great driver up-front. He let me learn at my pace. And that’s the type of person Roger Penske is. Rusty Wallace was not driving for Penske when he won the 1989 Cup championship. But Wallace retired as the third-winningest Team Penske driver in a career that produced 37 victories. 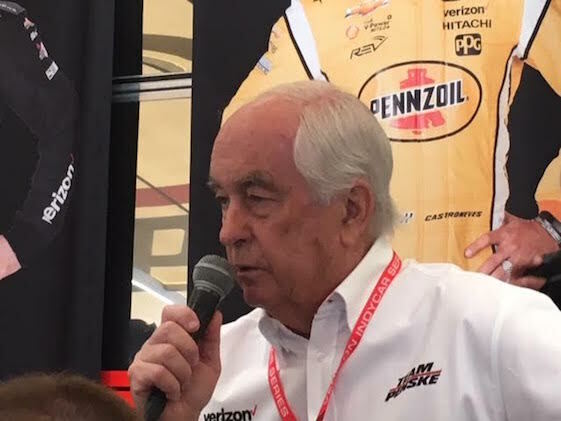 “I don’t know of anyone that has accomplished as much across all levels of motorsports as Roger Penske,” Wallace said. “I don’t know of anyone in motorsports that is as respected among all levels of racing and business as Roger. He’s my personal mentor and my personal hero. He’s one of those guys that just commands respect. Not just because of all of his success, but because he really cares about people.